With the holiday season moving into full swing, families across the country are in the car and on the go. Whether you’re driving across the country to visit family or across town to holiday shop, it is important that your child passengers are riding safely and that child safety seats are used correctly. AAA estimated that 30 million people travelled this Thanksgiving holiday alone and, for many, this is just the beginning of the holiday hustle and bustle. Now is the time to utilize the Child Car Safety tools provided by the U.S. Department of Transportation’s National Highway Traffic Safety Administration (NHTSA) and the Ad Council to learn more about proper car seat use and installation. You will find informative resources that include instructional videos. Have child passenger safety questions that you need answered before you travel over the river and through the woods to Grandma’s? NHTSA is always available to answer your questions online through Facebook and Twitter. Why is this so important to me? Back in July 2006, we were driving to the store. My husband was driving our van, I was in the passenger seat. In the back seat was my mother and almost 3 year old son NHL. We were on a six lane major road and had a green light. As we passed through the intersection, another car going the opposite direction made an illegal turn into us. Our van went flying across six lanes of traffic while up on two wheels. After doing a 180 degree turn, we stopped in the grass looking back in the opposite direction. Someone was watching over us that day. On a regular day, oncoming traffic is usually heavy in the other direction. We were not hit by another car, we missed the center median (or I would have been a goner). The adults in the car were shaken up and my mother really hurt her back. The person in the car that jumped out of his seat with no complaints was my son thanks to his car seat. The car seat below had to be replaced since we were in a collision and the kiddo helped to pick out a replacement pattern. 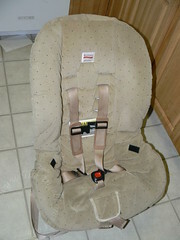 From day one, we took our car seats to a local dealer that had a specially trained car seat installer. Thanks to him, we knew our LATCH was done correctly. 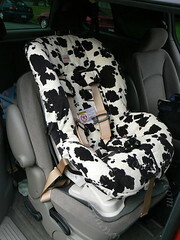 My then three year old is now a thriving 6 year old in first grade because his car seat did it’s job. Remember, kids are precious cargo, so make sure your car seats are installed properly and buckle up when you hit the roads. Disclosure: I am a member of Global Influence and asked to participate in their LATCH Cross Country Blog Tour. As a parent I felt it was extremely important to share these recources with others to protect all children that ride in cars.